This day, Christmas, might be the first good day Sony Pictures has had in a month. Ever since the movie studio was crippled by a cyberattack on Nov. 24, it has been on the defensive. Last week, after hackers objecting to the content of "The Interview" threatened American moviegoers, Sony (SNE) canceled the movie's Christmas day release in 3,000 theaters from coast to coast. But now the scandalous Seth Rogen comedy has been resurrected. Yesterday it went on sale on the Internet. Today it's coming out in 331 independently owned movie theaters, some of which have already reported sell-out crowds -- perhaps the best Christmas gift Sony could have wished for. Rogen showed up at a midnight screening in Los Angeles to celebrate the movie's unlikely release. "If it wasn't for theaters like this and people like you, this wouldn't be" happening, Rogen said, adding an expletive for good measure. A few hours later, the movie opened at the Cinema Village theater in the Greenwich Village neighborhood of New York City. 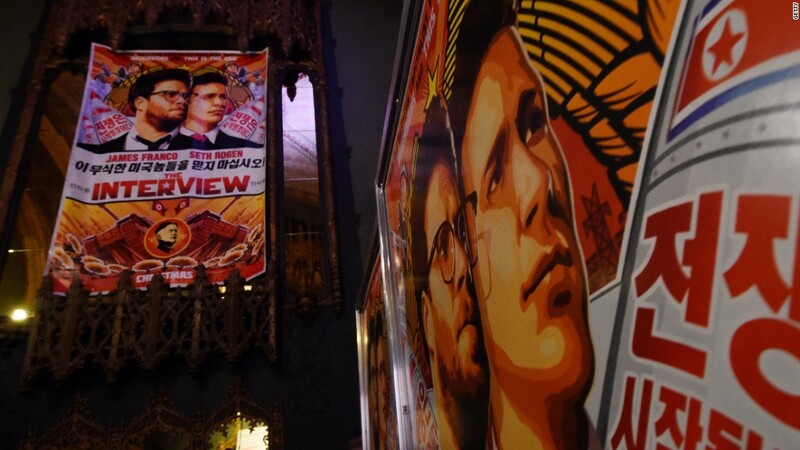 Some of the film's fans waiting in line said "The Interview" wasn't just holiday entertainment, but a "patriotic duty" in defense of freedom of expression. "It is a celebration of the constitution. It's very important to show that any idea can be expressed," said Willie Jasso, who was first in line. The comedy, which has received mixed reviews, is about an assassination plot against the North Korean dictator Kim Jong-Un. It is widely believed that the cyberattack was partly related to North Korea's fury over the movie, which the country has called an "act of war" by the United States. Hackers invoked 9/11 in a Dec. 16 message warning Americans to stay away from theaters playing the movie. But on Thursday morning the mood at Cinema Village was festive rather than fearful. "It did not seem like a credible threat anyone could carry out, and now it's even less likely," said Mark Rosenzweig, another patron at the theater. The FBI and local law enforcement have worked with movie theaters on steps to ensure security at screenings of the movie. While some movie buffs lined up on Christmas morning, many others shrugged off the release -- and that's a point that a spokesman for President Obama made in a statement on Wednesday. "People can now make their own choices about the film, and that's how it should be," White House deputy press secretary Eric Schultz said. So now the question becomes: how many people will really pay to see "The Interview?" It's too soon to know how many tickets have been sold. And a Sony spokesman reaffirmed on Thursday morning that the company will not be releasing any immediate data about the number of online rentals. The movie is available for a $5.99 rental through YouTube, Google (GOOGL) Play, Microsoft's (MSFT) Xbox video store, and a special web site set up by a startup called Kernel. The sites do not provide video view counts for movie rentals, but on Thursday morning "The Interview" was listed as the No. 1 seller on YouTube and Google Play. Kernel said there was "tremendous demand" shortly after the 1 p.m. ET release on Wednesday. "Tremendous" is the same word that Charles Roark, the owner of the Hollywood Cinema in Martinsville, Va., used to describe anticipation for "The Interview." "We are one of only two theaters in Virginia to get the movie, and the phones have been ringing off the hook for advanced sales, as well as customers flooding the doors," he said, calling sales "more brisk than nearly any previous movie we've ever shown." The simultaneous physical and digital release plan was stitched together in recent days. It came over the objections of some of the big movie theater chain owners, which are reluctant to have movies rented on the Internet while they're still on big screens. A spokesman for the National Association of Theater Owners declined to comment. 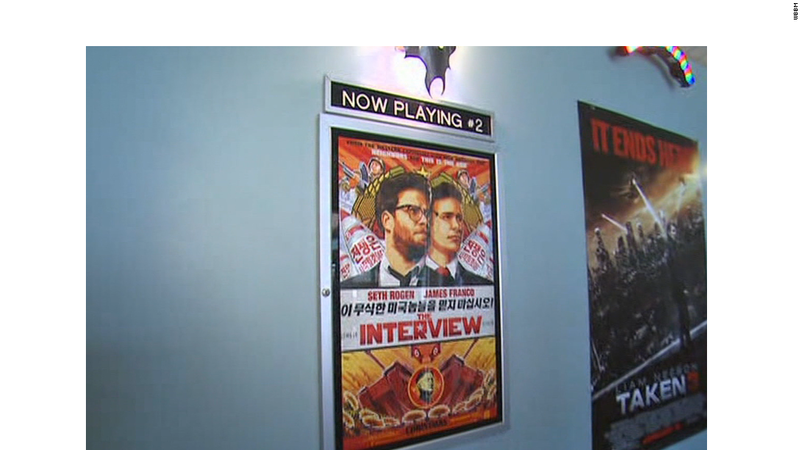 One of the chain owners' concerns is pirating, and sure enough, "The Interview" started to show up on illegal file-sharing websites by Wednesday night. The New York Times reported that a Chinese-subtitled version has the title translated as "Assassinate Kim Jon-un." The smaller theaters that agreed to show the movie Thursday were aware of the digital distribution plan ahead of time. Steve Mason, a co-owner of the Cinémas Palme d'Or in Palm Desert, Calif., said he had been requesting to show "The Interview" ever since the big movie chains backed away from plans to release it last week. His cinema now has two showings of the movie on Thursday evening. "Independent theaters are fearless. We are in it for the love of film," Mason said in an email to CNNMoney. "We would never back down from showing this movie or any other one." Michael Lynton, the Sony Pictures CEO, sounded similarly confident in a video message to staff on Wednesday that was obtained by CNN. "It was essential for our studio to distribute this movie, especially given the assault on our business and on our staff," Lynton said. "This film represents our commitment to our filmmakers and free speech," he added. "While we couldn't have predicted the road this movie traveled to get to this moment, I am proud our fight was not for nothing, and that cybercriminals were not able to silence us." Lynton also emphasized that "we continue to seek other partners and platforms to further expand the release." Those other partners could be the big chains, or they could be digital distributors like Netflix (NFLX). A Sony spokesman declined to comment Thursday on reports that Netflix might stream the movie to its subscribers in the coming weeks or months. --CNN's Pamela Brown and Rosa Flores contributed reporting.